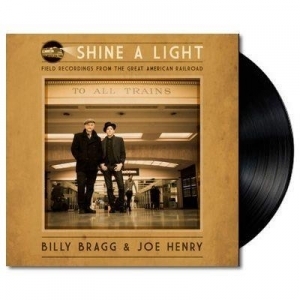 Recorded While Travelling Across America By Train Shine A Light Features Songs Originally Made Famous By Hank Williams, Lead Belly, The Carter Family, Jimmie Rodgers, Glen Campbell, Gordon Lightfoot & More. In March 2016 Billy Bragg and Joe Henry, guitars in hand, boarded a Los Angeles-bound train at Chicago’s Union Station. Winding along 2,728 miles of track, the pair recorded songs while the train paused to pick up passengers. In waiting rooms and at the track side in St Louis, Fort Worth, San Antonio, Alpine TX, El Paso and Tucson they set up their recording equipment, and performed classic railroad songs while keeping half an eye on the train and jumping back on board just before pulling out for the next town. After four days crossing the country, they pulled into Los Angeles at 4:30am, recording their final song in Union Station accompanied by the first chirpings of the dawn chorus. The resulting album ‘Shine A Light: Field Recordings From The Great American Railroad’ features the perfectly matched voices of Bragg and Henry and captures the varied atmospheres of the environments in which they recorded—from the close proximity of soft-furnished sleeping cars to the cathedral-like ambience of historic railway stations. ©2019 Leading Edge Music. All Rights Reserved.